ROBsessed™ - Addicted to Robert Pattinson: Brace yourselves. Is Robert Pattinson reteaming with David Michôd (The Rover), Joel Edgerton (Life) and Brad Pitt (The Lost City of Z) for a new movie? Production would start in June! Brace yourselves. Is Robert Pattinson reteaming with David Michôd (The Rover), Joel Edgerton (Life) and Brad Pitt (The Lost City of Z) for a new movie? Production would start in June! 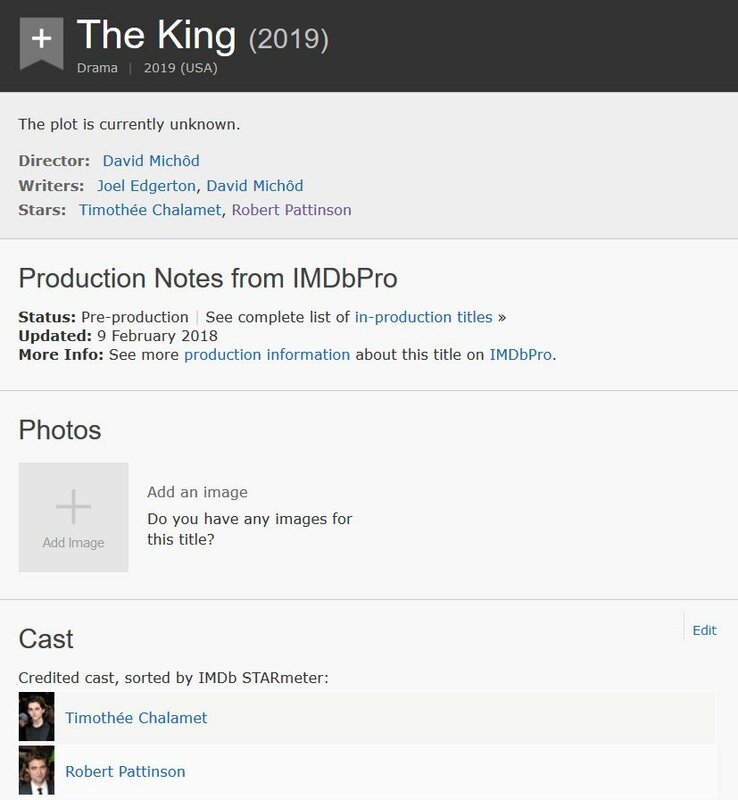 The King would have Rob rejoining his The Rover writer/director, David Michôd, and Life costar, Joel Edgerton, if IMDb proves to be correct. Rob also worked with Brad Pitt who co-produced The Lost City of Z. Brad recently worked with David in War Machine available on Netflix. Little White Lies posted about The King, which will star Oscar nominated, Timothy Chalmet (Call Me By Your Name), but they might have gotten their info from IMDbPro as well. Michôd...According to Deadline Chalamet is set to appear in The King as the eponymous English monarch, who famously led his army to victory at the Battle of Agincourt in 1415 during the Hundred Years’ War with France. He died aged 36, leaving the throne to his infant son. Michôd’s previous feature, the Brad Pitt-fronted military satire War Machine, arrived on Netflix last year to little fanfare. The Australian filmmaker has teamed up with regular collaborator and compatriot Joel Edgerton to pen the script for The King, and with Chalamet joining Robert Pattinson in the principle cast, we’re bracing ourselves for something big. Oh I would definitely be bracing. Timothee Chalamet is firming his first starring role since being Oscar nominated for his breakout turn in Call Me By Your Name. Chalamet will star as the title character in The King, a Plan B-produced drama helmed by David Michôd. Production will start in June. Joel Edgerton and Michôd wrote the script. Chalamet will play the young Henry V. After his brother is killed in battle before his coronation, a young king is coronated in the late 1300s. The reluctant ruler wears the crown at a time when England was near a war with France, and the empire is teetering. He rises to the occasion, admirably. Plan B’s Brad Pitt, Dede Gardner and Jeremy Kleiner will produce along with Edgerton and Michôd. Liz Watts, who produced the Michôd-directed Animal Kingdom and The Rover, are also producing. Michôd made his most recent film with Plan B and Netflix, the Brad Pitt-starrer War Machine.